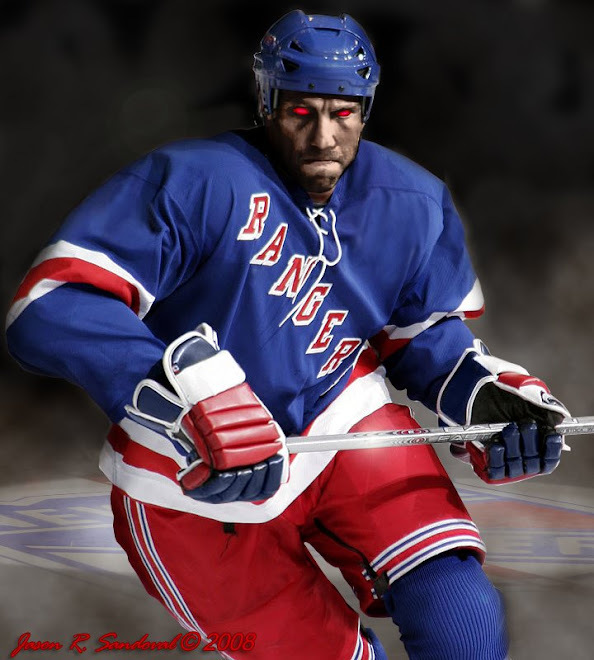 The Dark Ranger: Marek Malik Our Third-Line Center? Just kidding, but I got your attention nonetheless. Though The Dark Ranger has been advocating for Malik's removal as our heavy 'D'-Man this upcoming season, I must reflect on the following video -- the first segment a slow-motion winning penalty shot by Marek Malik himself - more than anyone would expect from the most boo'ed New York Ranger of last season. Watch how this moment happens so quickly, within seconds - a distant Moog synthesizer is heard followed by a crescendo of rocking music. Then we see an unfamiliar confidence in his face. We are then treated to a montage of excellent Ranger moments - followed by those echoing sounds of THE KING! Malik - for this moment only, I simply bow to you in your moment of brilliance. Perhaps a little more of this this season should be expected of you. So i'm not really up to date on my NY Rangers whipping boy... why do you guys hate Malik again? Marek Malik is a plus 32 player last season, and slightly higher over the last couple of seasons. On paper they're strong numbers, but his level of play is not represented in these numbers. On ice, and my entire section calls him the 'skating 2x4', he is uncomfortable and makes bad decisions that lead to goals against our team. When this happens (and often), all of MSG groans simultaneously. He is one of the only players -- in recent memory -- that is 'boo'ed' by the home fans, even when the team is winning. The latter part of last year, when the Rangers won - I think - 17 out of 20 games to make the playoffs - even then, Malik received 'boo's' from everyone - before the game started. It must feel horrible for him. Imagine how the fans feel. Who is the Avs equivalent? Well the Brisbois was the hated avs player, until he was recently shipped out, but he REALLY stunk last season. Nobody liked Brad May either, and he was shipped out. On the current roster, other than Theo, i can't think of a player who is generally despised. You have solid team this season. No questions there.